Cinematography Archives - Page 2 of 7 - … catching light in motion! On Wings of Hope beautiful cinematography wins "Award of Excellence"
"On WIngs of Hope" the 2013 documentary film produced by Photography by Depuhl in Afghanistan won the Award for Excellence for cinematography. Videographer Awards today announced winners for the 2015 international awards competition. Videoawards.com recognizes outstanding achievement by talented individuals and companies in the video production field. ​Entrants include video production companies, advertising and public relations firms, corporate communication departments, cable and broadcast television operations, government agencies and other visual content producers. 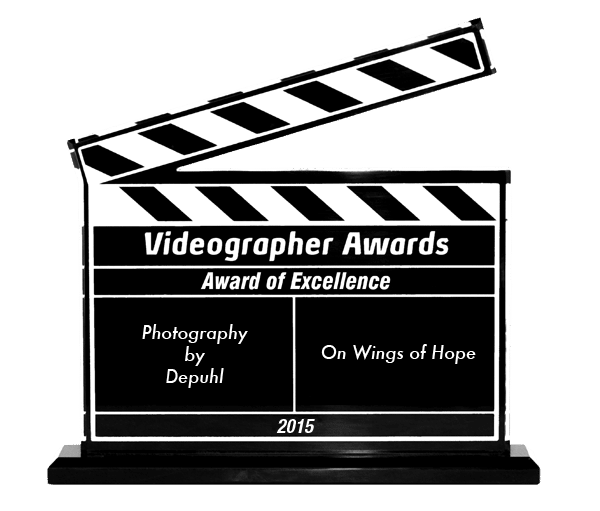 Another award for "On Wings of Hope"
The Award of Excellence, the organization’s top honor, adds yet another award to the accolades this video production has received in the past years. On Wings of Hope was won the award for excellent cinematography. There are many components, that go into a successful motion shoot and as photographers the one we are most familiar with is the visual portion of video. We learn very quickly that we must master story telling, audio recording and editing as well, but we often take the visual crafting of an image for granted–until we turn on that first continuous light source and quickly realize, it has very little in common with the strobes we’re all used to. This Move2Motion Video Lighting workshop will focus on the most commonly used lighting instruments in video production.It’s not designed to teach you how to light–we’re assuming you already know how to do that. Unsure of the difference between a open face par and a fresnel? Want to learn more about why a tungsten light renders a much better color than LED? Surprises that a fluorescent bulb can be have a color temperature of 3200ºK? Wondering why an HMI needs to be flicker free? Then this workshop is for you. Join us and get ready to learn some theory, basic terminology and a hands on comparison of a variety of different continuous light sources. Bring your gloves – ’cause the lights get hot and your color meter – you do still have that, right? A seminar for photographers that want to make video. Better. This is part of PPA’s Super1Day educational series. The cost for this seminar is $99. All payments will be handled via PPA signup. Video Lighting Workshop – a workshop that gives you a hands on experience of continuous light sources used in video productions. A huge shout out to our friends at Magic2Lighting, who are supplying the bulk of lighting and grip gear for this workshop. Special Thanks to BlueShape Batteries that are going to power all the portable lights. Stay tuned for more sponsors and event details.